Congratulations to eRay and the Atlanta Striped Bandits! They are going to finals, after beating the Detroit Turbos, 15-7 in voting. However, Austin and Honolulu are tied at 11 apiece. Now, since eRay is guaranteed in the finals, the option rests on his shoulders. Now, you can either face-off against Austin in a tie-breaker, forfeit and have a Austin/Atlanta final, or the last option, face off against Austin in the finals as either Honolulu or Atlanta. "One ring to rule them all..."
I will forfeit the tiebreaker and have an Atlanta/Austin final, for the sake of keeping it interesting. Just mark down in the record books that this is not a cowardly forfeit please, thats not me. I can honestly say that making it to the finals, even if it is under unique circumstances, is something I absolutely NEVER expected when I started the tournament. (AP) -- The Atlanta Striped Bandits and the Austin Stars of the National Hockey Association (NHA) have applied and been approved for relocation of their clubs. The Atlanta Striped Bandits have hired eRay to decide their location and identity, and the Austin Stars have done the same with bruschimania. Well, you heard them guys, and there's your challenge. Your teams have relocated to wherever you want. No limits. Deadline is June 7th, 11:59 PM. Well, you heard them guys, and there's your challenge. Your teams have relocated to wherever you want. No limits. Deadline is June 7th, 11:59 AM. Ironic. The Austin Ice Bats will indeed fold or relocate to make room for the Austin (Texas) Stars. Hey Brass, do you have the initial roster list? Obviously(and to add a little challenge), no one would relocate a team to an area that already has a team. What should we include in this? Team logos/uniforms/arena logos/inaugural season logos/whatever else, or just a new logo package? Whatever you want. I decided to not to tell what to include, so that it would become more competitive and interesting. Get to see which designers were really thinking outside the box. The deadline is fast approaching guys. I hope your concepts are going good! Mine should be. Working on it/brainstorming has been a great distraction from my surgery next week, so that's a good thing. The Austin Stars today confirmed their move to Montreal. As has been speculated for some time, Austin today confirmed their departure from the warm-weather Lone Star state and their intention to move to French Canada's largest city, Montreal. The team name, in English, is confirmed as the Royals, taking the name from the Mount Royal that is on Montreal Island north of the city. The primary logo is a simplified lion's head, designed for several lion statues on the Island. The secondary logo is the Fleur De Lis. Only home and road uniforms were announced, both involving a heavy amount of gold, along with white and a deep royal blue. Well done, bruschimania. My logos are done and colors chosen, uniforms will round out the lot and they should be up by Friday afternoon. After an ownership change and a stadium contract dispute, the Atlanta Striped Bandits have essentially been forced to relocate and end their 50 year history in Atlanta. Since the other reloacted club changed leagues, Atlanta will as well. They have chosen to move west and land themselves in Sacramento, CA. They have chosen the name "Swordsmen", a moniker never used by a major professional sports franchise before. Their primary logo is an old english S formed with the help of a sword. Their alternate logo also includes a sword, but not just one, two crossed swords. The logos represent the power and force that the team plays with. Their colors are Deep Red, Gold, and Sacramento Silver. The Deep Red and Gold are updates of their Atlanta color scheme, Red and Yellow, and Sacramento Silver was added to signify the teams appreciation for the city that is welcoming them with open arms. 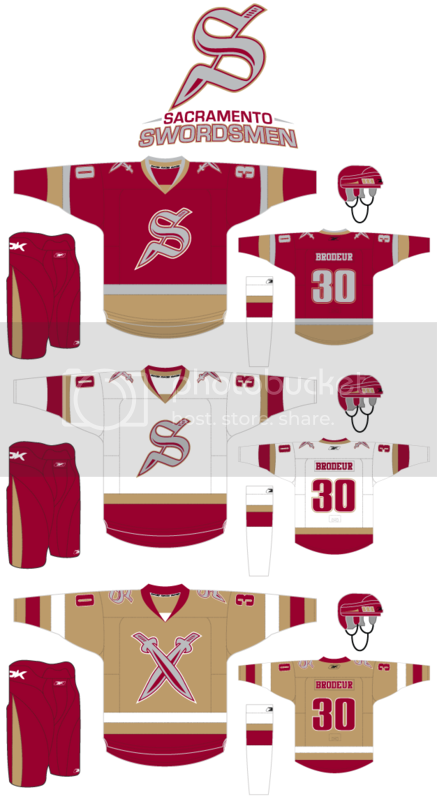 Deep Red and White uniforms are used at home and on the road, and a Gold alternate has been introduced for some home games. Man, eRay, that set is SICK!!! You owned this contest and deffinatley deserve to win!!! I believe that this contest has passed the re-branding of the Tampa Bay Devil Rays as the longest contest ever on CCSL. A contest that has been going on for 3 1/2 months? Outrageous. Uhm, did you not bother reading my post? In a related note, Eray those jerseys are awesome and I would pay money for that Alternate. So in other words, this contest could go on forever?